–She has a tranquil demeanor. –She has conquered the demons, or at least has moved on. –He has a clear belief in God or an obvious spiritualism. This might describe my first two yoga teachers, whom I admired while despairing of ever emulating. One of them, Karin O’Bannon, encouraged me to teach; she helped me struggle with philosophical questions; her faith was the foundation of my faith in myself. So, when she died June 10, 2013, 16 years after we first met, my world faltered. –He curses. He yells. He gets angry, even furious. –When demonstrating poses, he is somewhat famous for moving his shorts around until much of his buttocks or even tailbone is visible, so that we might see subtle actions not evident through fabric. –He will risk physical injury to himself to help his students. –He exhausts himself exhorting us to understand how to help ourselves. –He laughs, mostly at himself. Less obvious is that he is one of the most compassionate people I have ever met. Whatever his spiritualism or beliefs in a higher power, he pretty much keeps them to himself. Having just spent a week-long intensive with him, I have much more of an idea of where his compassion comes from. I know better why I was drawn to his classes even during the first several years that I was so terrified of the challenges I would face in his weekend workshops. At first I thought it was the physical challenges that sent me out of the room in tears. Over time, I realized that it was coming face-to-face with my weakness of will. Karin once told one of my students that my student and I were made of the same “clay dust.” Manouso has said that we are attracted to teachers who are like us. I now know that is certainly the case with Manouso, at least in terms of attitudes. Clearly not in terms of teaching abilities. It was a shock the first time I heard Manouso tell us that he approaches each class terrified. He tells teachers that if we ever feel competent, quit. By that yardstick, I have permanent job safety. Over time I’ve gleaned a bit of information from Manouso himself and from other students about his childhood traumas. I have enough of my own that I’ve come to realize that it is something I can draw on to reach out to students suffering from heartache. This past week, he described his first experience in pranayama in India with his teacher, B.K.S. Iyengar. He related a tale of a disaster, of a feeling that he was so damaged that he couldn’t possibly do this thing. This story and others that morning had a moral: That, from a certain perspective, damage adds value. I realized that this very damage is the foundation of his compassion, of his determination to help others find emancipation from our sorrows, our damage, through yoga, just as he is doing. I do not have the strength and inquisitiveness that Manouso has demonstrated in reaching the point not of overcoming his demons, but of living with them. I do have another asset. I am stubborn. I don’t know how to quit. I finally have an understanding of why some of my students have said I am inspiring. I never really got it until I realized how inspired I am by Manouso. Maybe it’s because I am so deeply flawed, and those flaws are so visible, both in my poses and in my attempts to live yogically, that I am inspiring. At the end of our week’s classes. Manouso grinned and announced that he was the luckiest man on earth. I understand the feeling. All of my flaws have brought me to this place where I am so fortunate as to be a yoga teacher. He egged us on in our practice. We’re SUPPOSED to make mistakes. Be in it for the journey. Keep a sense of wonder at what might happen next. This entry was posted in Philosophy, Teachers on July 9, 2013 by Sadhaka. Eighteen years ago Lesley was assistant director of student affairs for the Cal State University chancellor’s office. She left work a bit early for a family gathering. She never showed up. Her car had been broadsided by another driver after a hit-and-run driver set her car spinning into traffic. Lesley uses a strap to keep her arms elevated and a wall for a bit of extra support as she does a wheelchair version of jathara parivartanasana. By the time her family found her unconscious in a hospital hours later, doctors told them she would never survive and even if she did, she had suffered such severe brain damage she would be a vegetable. She told me her story a few months after she began coming to my yoga class in 2012. A Dial-A-Ride bus drops her off more or less in time for class, and she rolls in with a motorized wheelchair, always dressed to the nines. She came the first time at the urging of a friend who knows how much more yoga is than physical movement. She came the first time, hesitant, unsure how it might all work out. I wasn’t sure she would be back, she seemed so sad. Her friend assured me, though, that Lesley had loved the class. In fact, Lesley has become a regular. The brain stem damage has left her with little control of the left side of her body. The muscles have become very tight from disuse. Even the right side is tight after years spent in a wheelchair. She says she started yoga to try a form of physical movement she could enjoy. 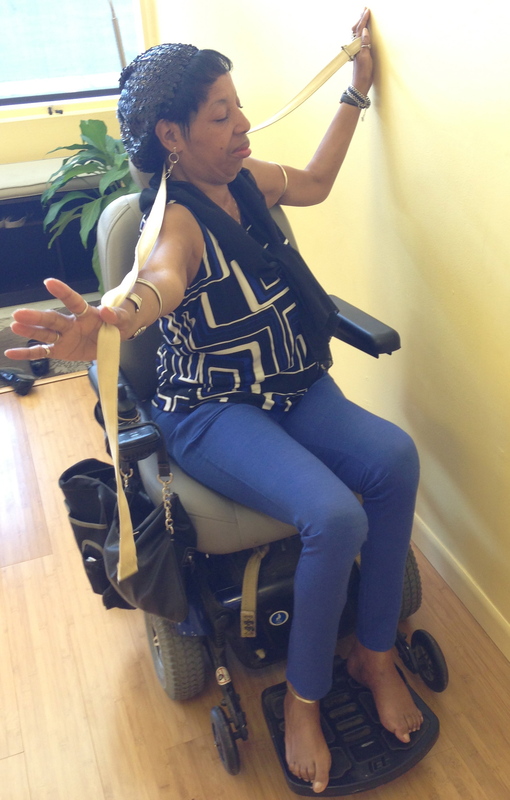 Lesley uses the back of a chair open her front and side chest and to stretch her shoulders. We keep working on variations on poses. Bharadvajasana, a seated twist, gets extra power with the help of a wall. A wall helps her bring her arms upward into urdhva hastasana, from there she can gaze upward. A strap can help her extend her arms out to the side. 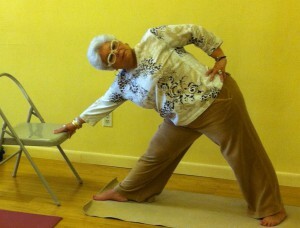 A chair in front helps her into a version of child’s pose. Her chair back can recline back somewhat, and a mat rolled up behind her spine helps lift her chest. For garudasana, eagle pose, she entwines arms and legs. I pick poses that might help lift her chest and so lift her mood, or that might get the left and right sides of body and brain cooperating. It was when she came to a pranayama workshop that I learned why she was so sad. She had never seemed like someone who felt sorry for herself. It turns out she felt such sorrow for her husband, that he had to take care of her. I know, though, that he must take strength from her beauty of spirit. It is so evident. 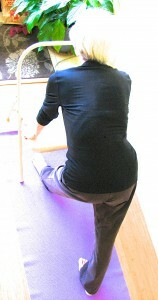 A sticky mat rolled up behind her spine, Lesley works on a version of upward arms in supine mountain pose. This entry was posted in Philosophy, Physical limitations, Students on June 27, 2013 by Sadhaka. For some yoga students, the act of walking into a yoga class is a leap of faith. It’s true for many of my students, who bring woes ranging from gout to bulging vertebral discs to post-traumatic stress disorder. Karin O’Bannon looks here much as she did when I met her in 1997. Photo courtesy of Elizabeth O’Bannon. That I am standing in front of them teaching yoga is an act of faith as well. I must constantly draw on the words of the teacher who taught me to teach, Karin O’Bannon. She asked me on my third day of yoga teacher training if I was teaching anywhere. I stammered, that, no, I wasn’t. Was she crazy? Here I was with all these people who were actually GOOD at the poses. And she addressed me while I was struggling my way into ardha chandrasana, my elevated leg mere inches from the floor, restricted by such impacted hip joints that two years later I would have them both replaced. My back was to the wall, and my hand was on a chair seat. I was shocked. I was there because my teacher at a health club had urged me to get some training so I could sub for her. After my first day of class, I was sure I could never teach, but I was there to get more of the learning Karin provided, which had immediately taken hold of my heart. I struggled with more than my utter inability to do the poses with even 10 percent of the quality of my fellow students. When I started teaching, it was with her faith in me. Over the years, perhaps encouraged by my own limitations, students came to me with problems and encouraged friends to come, too. Their courage inspired me. Over time they learned to have faith in yoga. When they thanked me, I had to point out that they were the ones doing the heavy hauling, that it was the yoga and their work that they should thank. One day a 30-something student came to me who was in such immense mental pain that I felt overwhelmed. I was so frightened of doing her harm. I contacted one teacher by e-mail. She told me to trust my instincts. I realized later that what I came to trust was the student’s determination to heal herself and the ability of the yoga itself. A few months later, I was able to see my teacher Karin and ask her directly for advice. (She had moved to India a few years earlier.) She said the same thing, to trust my instincts. Then she looked me straight in the eye and said: “And know that she is a gift.” I had no idea what she meant at the time. Her workshop that evening touched on Sutra 2.15, that it was the “axial aphorism” for the entire text. Eventually our discussion went to ishwara pranidhana, my old nemesis, as she knew. And she said it might also refer to surrender to “absolute truth”. As a former journalist, I found the idea of an absolute truth perhaps even more difficult to grasp than the concept of a supreme soul. 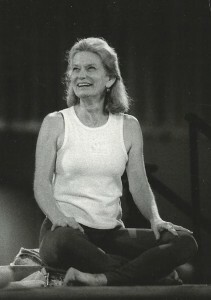 The 30-something woman and I attended the Iyengar yoga conference in Washington, D.C., in May 2012, in large part to be able to study again with Karin. We also attended Professor Fred Smith’s discussion of the Yoga Sutras. Here I came across another explanation of the niyama: surrender to the “lord of yoga”, to trust in the act, the doing of yoga. I thought I had come to that point, teaching as an act of faith in yoga. Then I learned my teacher Karin is terminally ill , and I realized that, no, I was still teaching from her faith in me. Without her, how could I find the courage to keep teaching? Student by student, the answer has come. Sometimes from someone who knows I am quavering, but as often not. Over the past weeks, many students have told me that I am an inspiration and that is why they have found healing in yoga. Rather like when I heard my teacher Karin, I have no idea what they mean. I am so very ordinary. But I find that I must accept their faith if I am to keep on teaching. And so the gift I have wanted to give my students, faith in yoga, has come rebounding back, multiplied many times over. This entry was posted in Students, Teachers on April 25, 2013 by Sadhaka. Wanda could come to any class, but she sticks with the slow-paced class she first joined with her mother. I can’t see Wanda without thinking of her mother, Mildred, and missing her. Wanda comes to class even though she can’t help but think of her mother and miss her. They first came to class in 2003, perhaps 2002. Wanda did tai chi, got acupuncture for neck problems and sought whole health. She and her mother loved great jewelry and getting great deals on beautiful eyeglass frames in LA. They both loved their family and helping others. The first time they came to class, Wanda brought her mother, and yet smiled and detached herself from the outcome. Mildred gave me a kind of Missouri “show-me” look, pretty startling in a 70-plus-year-old girl from Puerto Rico. Mildred always had a slight smile. Mildred arrived a skeptic to my first class. I thought at the time she had been pretty much dragged there by Wanda. Over time I learned that Mildred couldn’t be dragged anywhere, but she was willing to try, often repeatedly, something that might help make life better. A few weeks after she started, she showed up with a tiger-striped mat. For several weeks when ill-health kept Wanda away, Mildred came on her own. One day Mildred complained about how difficult her outing had been at an outlet mall. I showed her how to do virasana, hero pose, while sitting in a chair, one leg at a time. About a month later, she reported she was back in full shopping form. With Mildred’s asthma, lying on her back, even with support, often left her breathless. She had tight hamstrings and getting up and down off the floor was tough. Still, she did it. I watched over the years as she kept trying the poses that challenged her asthma. And 10 years later, there she was, doing bridge pose. It took a few years, but after a while, Mildred was the one bringing people to my class, some with minimal problems, one with Parkinson’s. Once after I had been gone for a couple of weeks, I started a class by saying “next we’ll do” and she filled in the pause with an answer: “jumping jacks!” and I learned how she had faced down a sub with a refusal to try jumping her feet apart. She was what I want from all my students: to be a discriminating student of yoga. She questioned, prodded, experimented. She never gave up. She was attending class until just a few months before she died of cancer. She was 86. It was a few months after that before Wanda came back to class. When she did, it was to encourage another friend to come to yoga. She greets the Dial-a-Ride bus each Wednesday morning as it brings a woman who must use a wheelchair after a terrible car accident. Someone else now sits in Mildred’s spot. Wanda has found new students to help. It’s a full class, but even so, I miss Mildred. This entry was posted in Students on April 14, 2013 by Sadhaka. These students demonstrate how supported uttanasana can be adapted to varying flexibilities, from the most flexible in the foreground to least so on the far right in back. The student on the far right has had a hip replacement and spinal surgery. Yoga students have come in all shapes and sizes and configurations: ages 5 to 87; male, female, transgender; straight, gay, lesbian; slender, curvaceous, overweight; flexible or stiff, better described as mobile or steady. Cynthia was in class a day after she broke her arm. She took care but found ways to do poses that helped her heal. Jody uses a block to learn the lifting action of the legs in head balance. They come the day after they break a shoulder, wearing a cast, or while going through chemotherapy, wearing a head wrap, or after a knee or hip replacement. 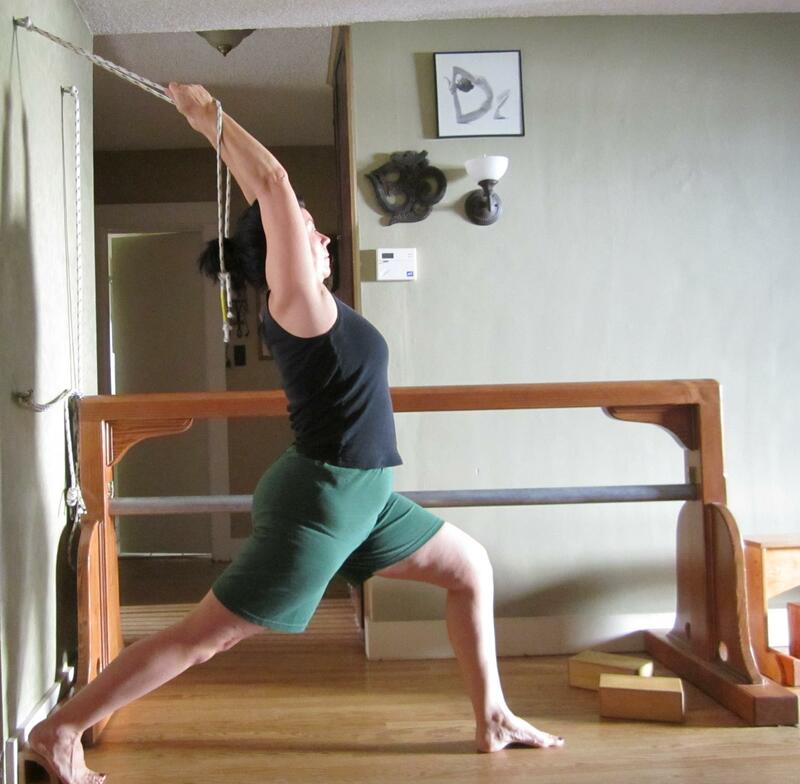 Susan finds yoga helps with her scoliosis and some other issues, as well. 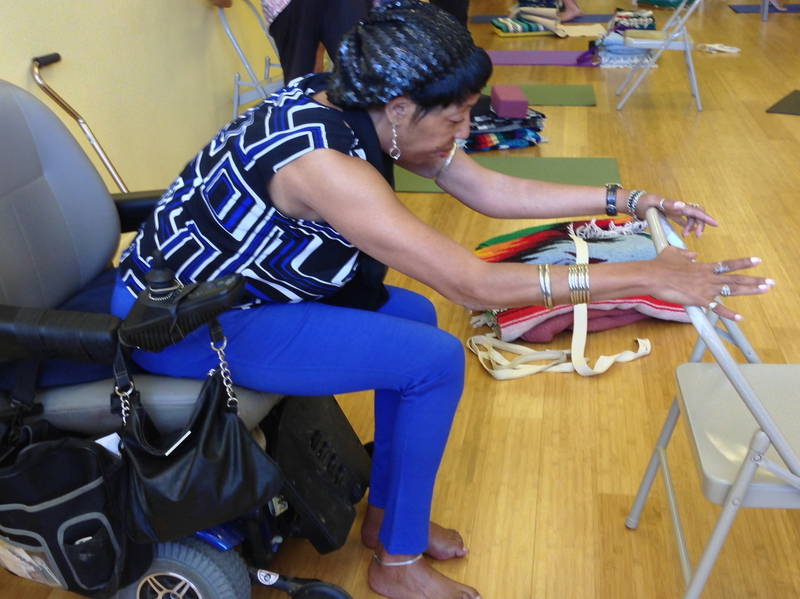 They come to yoga for help with fibromyalgia, degenerative joints, bulging discs, scoliosis. This entry was posted in Students on April 13, 2013 by Sadhaka. The Internet is replete with images of young, slender, flexible yoga students. Here is my attempt to balance that out with a few images of my own, starting with four Southern California teachers: myself, Denise Thibault of Orange, Tammy Gingerella of Riverside, and Marie Harris of Riverside. Denise challenges us all, taking teenagers and septuagenarians past perceived limits. Supported ardha halasana may be restful, but it does not provide the most flattering abdominal views. Tammy Gingerella demonstrates how props can create lightness in a pose. A student of mine mentioned how much she enjoyed Marie’s teaching of this pose, garudasana, eagle pose. This entry was posted in Teachers on April 13, 2013 by Sadhaka. Head balance is a favorite among many of my students, as Robin demonstrates here. When I was a child, I wouldn’t do a cartwheel. I didn’t like somersaults. I detested being upside down. It terrified me. Karin O’Bannon taught me my first head balance. I was 38 years old and a few days into her teacher training. Truth to be told, if I had known there were headstands in yoga, I never would have walked into a yoga class. Some frightened students ask me, what’s the point of it? The same question might be applied to asana in general. What do the poses have to do with yoga? And if yoga is the stilling of the fluctuations of the mind, head balance in particular might seem antithetical to yoga. Keep in mind that Patañjali defines perfection in asana as effortlessness, not in terms of its physical attributes. I knew none of this the day I faced my first head balance. It was six months before I tried it outside of class. It was several years before I could hear a teacher announce “sirsasana” without feeling dread. Then, for years, the pose was the mainstay of my practice. Of late, head balance has become ground again for the creative process Iyengar described. Now I face, not fear of falling, but fear of injury. Now, again, it has become that battleground for my fears, as I seek to perform the pose without injury, and yet to progress as well. No matter. When I’m in the pose, the fluctuations of thought do cease, I focus completely on the interplay of forces. This is the epitome of yoga. This entry was posted in Asana on April 13, 2013 by Sadhaka. Marit practices head stand regularly on her own. Marit’s story could be most any beginner’s. She came to her first class immensely unsure of herself. She had good reasons to be scared. She had suffered a small stroke and couldn’t stand in mountain pose without falling over. She brought a strong asset, however: her willingness to laugh. She was in her early 60s. A friend had urged her to come. She arrived with a big smile and very little expectations. After more than 10 years of regular class attendance and home practice, her headstands fill fellow students with awe. She started practicing headstands regularly at home because they can help with motion sickness. Now she can go on a cruise, with nary a moment of nausea. With help, she can kick up into handstand. She can step wide for utthita trikonasana, extended triangle pose. Like all of us, she may wobble. Like many of us, sometimes she sits down abruptly. And laughs. Mountain pose? Piece of cake. Of late, she has been getting her husband, once several inches taller than she is, to try a bit of yoga at home. He might even come to class, she says. And then she laughs. It took me years to learn to do a handstand, and now, again, I’m too afraid to do it. Behind all the physical excuses, the true excuses hide. Fear of looking silly in front of other people. Fear of not being as good as other people. Fear of trying and failing. Fear of not having any more excuses. Seven years after I took my first yoga teacher training classes, I told my teacher I was considering quitting my management job as a low-level editor at a newspaper with a good paycheck to become a full-time yoga teacher. Karin O’Bannon no longer lived in the area, not even in the country, and I had tried to discuss this with her two weeks earlier and had not found the courage. I knew she would give me an answer in the best interest of yoga students. I trusted her honesty, and feared it. I told her I just hadn’t had the courage. She gave me another withering gaze and said she knew few who acted with such courage. I was shocked. How could I be considered courageous when I was afraid of everything? She delivered a message that I have encountered many times since. It was new to me then. Now it has a sort of “duh” quality. Being courageous isn’t being without fear, it’s acting in the face of fear. When I quit my job, it meant walking away from all the “if onlys” of my life, walking away from the obstacles to santosa, contentment, accepting complete responsibility for my joy and my sorrow. Defined as acting in the face of fear, I had to admit, I had courage. So do we all, truth to be told. This entry was posted in Philosophy on April 13, 2013 by Sadhaka.